Create Pivotal Null was made to help make your rigging happen much smoother, much faster. You know how you're always making controller/helper nulls, then fighting through trying to get them lined up just so with one of your layer edges/corners? Yeah, me too. 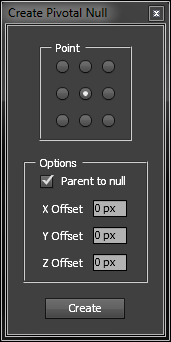 This simplifies the process by giving you an easy-to-use panel where you can simply choose where to put the null, hit the button and BAM, it does all the work for ya. Have multiple layers selected? Not a problem! The script will run through each layer and create a null at that point for each layer. Parent to Null - Whether to parent the layer to the created null or not. You usually want this on. X/Y/Z Offset - Amount to offset null from pivot point. Originally requested by Jayse Hansen.